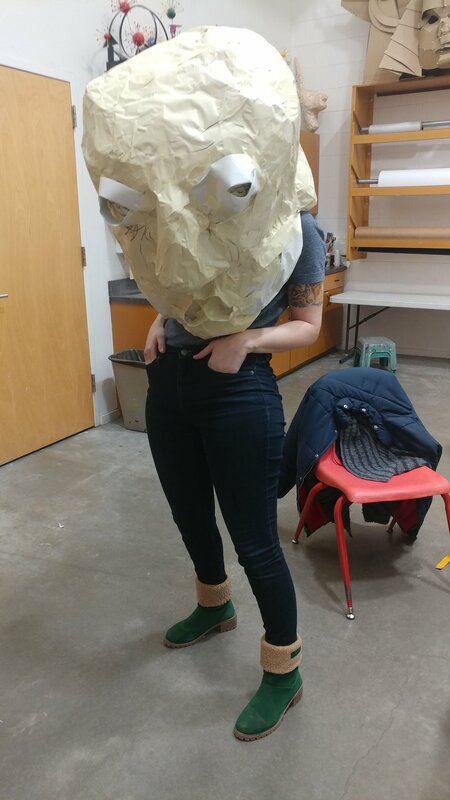 Week 1: My first large-scale / wearable mask! Week 2 - the Bus Driver emerges! 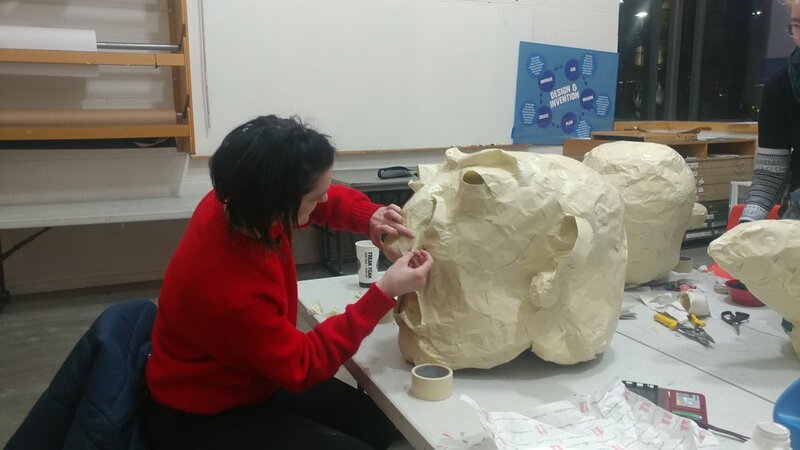 Week 4 - added some ears! Week 5 - painted and scowling! This contemporary production in the style of Peter and the Wolf is the latest of the Lawrence Arts Center’s interdisciplinary work and features resident playwright, composer, and narrator, Ric Averill, Print Resident, puppeteer, and scenic artist, Johanna Winters, and School of Dance Director and choreographer, Hanan Misko. Our artists come together to match up live musicians with dancers portraying the movement of the live instruments as they are challenged by the puppetry of the dangerous big city. The show will be a feast for the ears, eyes, and imaginations of elementary students and their families. Puppetry, Classical Neo-Romantic Music, Story, Dance, and Lights all blend to introduce young people to the instruments and families of the orchestra. 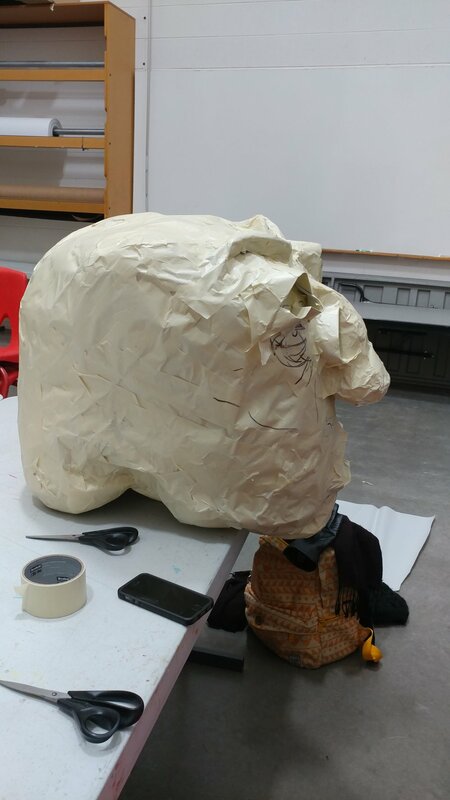 When the opportunity calls to help create GIANT wearable puppet masks AND ALSO perform in the show they are intended for, I do not say no! 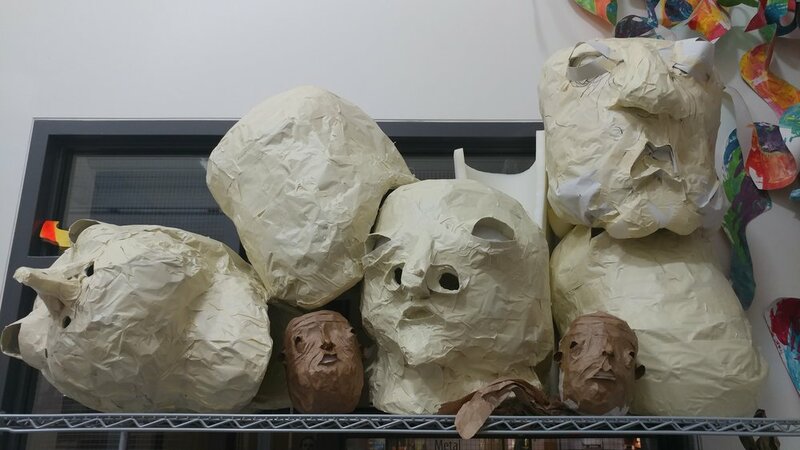 For the next few weeks, I’m helping build puppet masks for a variety of original characters, under the design direction of Johanna Winters. Each week, my three other classmates and myself learn Johanna’s process of molding with chicken wire and masking tape (MASKING TAPE!). 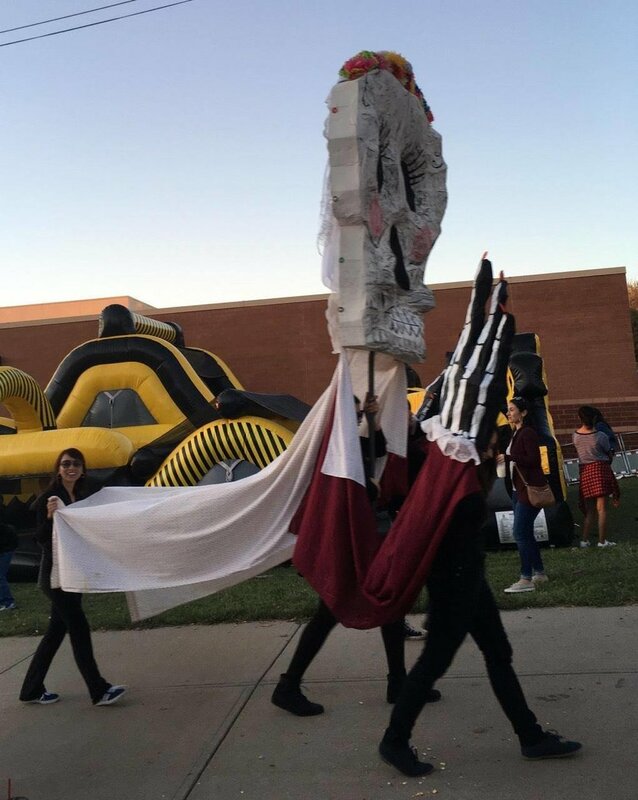 Having made exclusively with the papier-mache / cardboard processes I learned at Bread and Puppet, this is a new, lightweight process for working large. I’m having a lot of fun and look forward to working with the rest of the puppet team each Wednesday night! 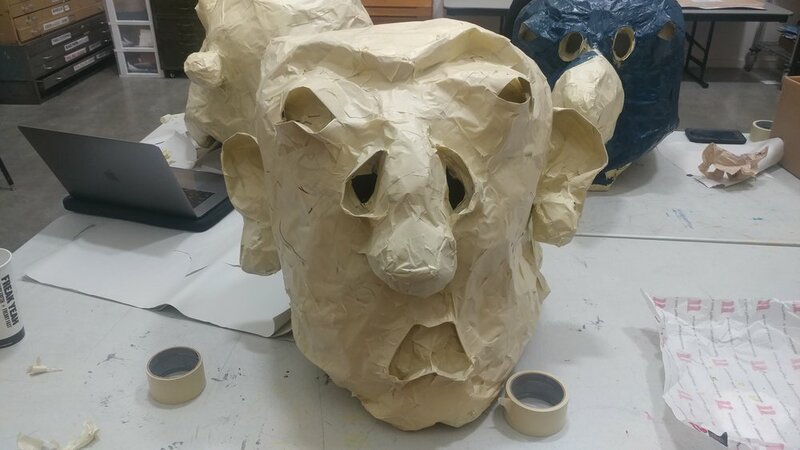 As if building the masks wasn’t enough fun for me, Ric Averill has asked that I perform each mask role on stage this upcoming April, combining my experiences as a dancer & performer with my technical knowledge as a puppeteer. I really couldn’t be more excited about this performance! Tune in for progress shots as they come! 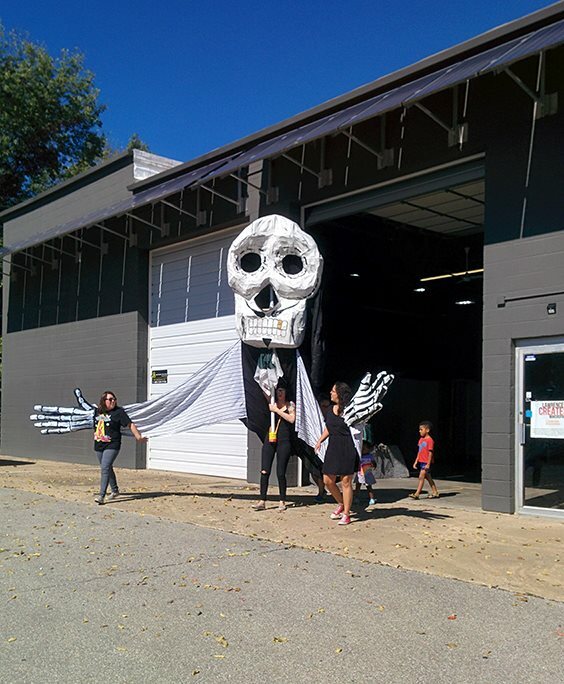 Bread & Puppet has offered me a pathway to making art with many hands. I wanted to put my new skills to use in a communal that way also served as the vehicle for my first celebration of Día de los Muertos holiday. My Cuban-American family never celebrated this holiday while growing up in Miami, but now that I have been in Kansas nearly ten years and with most of my Cuban family gone, I long to reach out and grasp the hands of familiars, both physical and metaphysical. These calavera puppets were created by a dedicated team of women, and performed in the Nelson Museum of Art (Kansas City, MO) and at the Mattie Rhodes Center (Topeka, KS) as part of their respective November's Día de Muertos festivities. 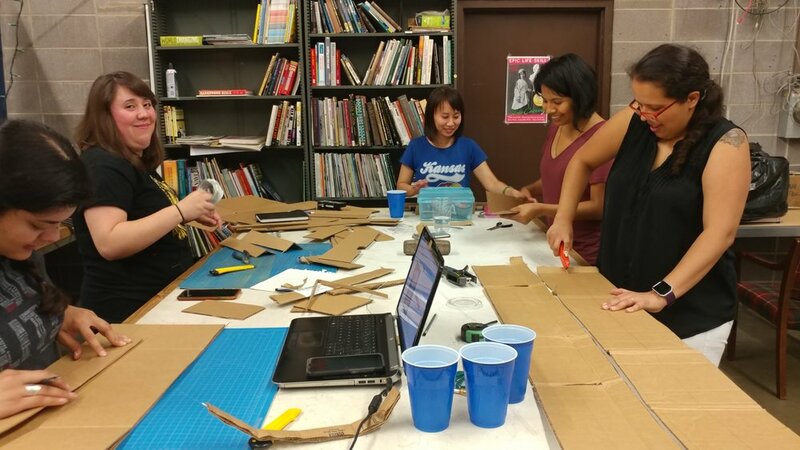 The creative team behind these puppets: Jasmine Deng, Mariel Ferreiro, Blanca Herrada, Vanessa Reynaga, Katherine Romero, Kim Trang, Sandra Yoder (with help from Jett and Ivory), and myself (lead designer/builder/puppeteer). 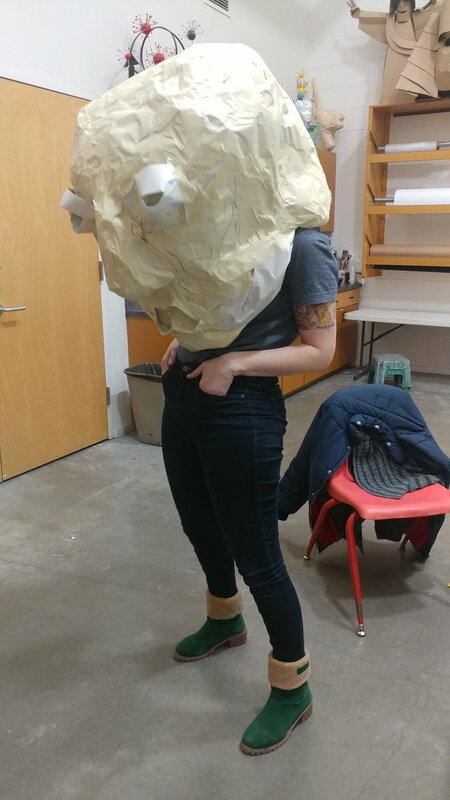 I had so much fun getting mad and monstrous with the youth of LFK at my papier-mache mask-making workshop at the Lawrence Public Library! 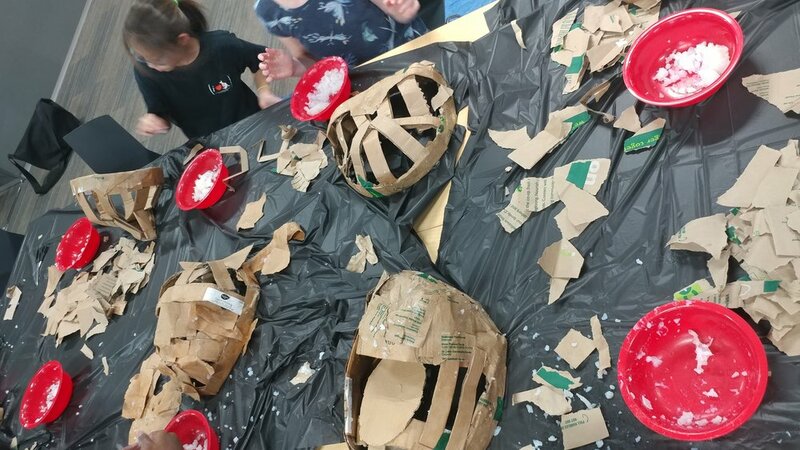 Using cardboard, grocery store bags, and a good amount of goopy-mache glue, students learned the methods of upcycled puppetry. 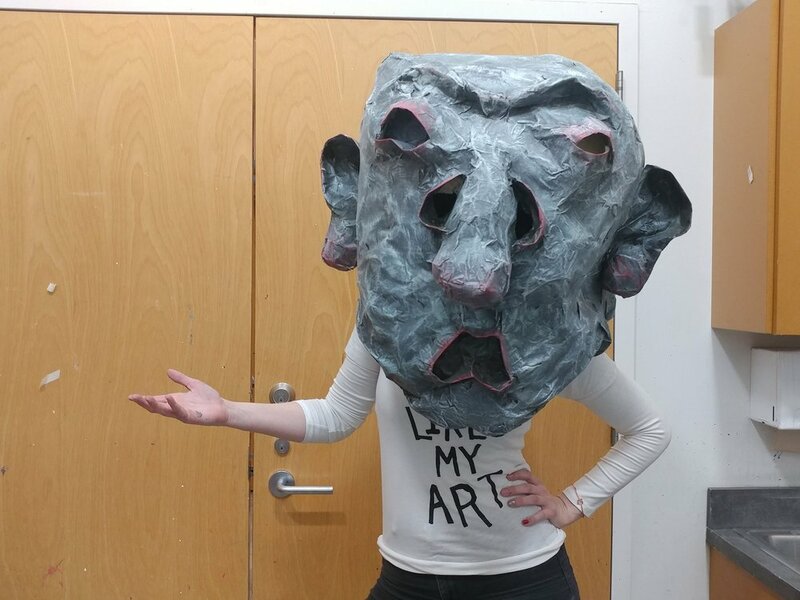 These young artists crafted every inch of their masks: from building a structured skeleton, to sculpting the outer contour form with paper, to painting and performance! All in six hours! Very proud of these kiddos and hope that where they see discarded "waste", they also see opportunities for imaginative making. Thank you to the Lawrence Public Library for having me over! 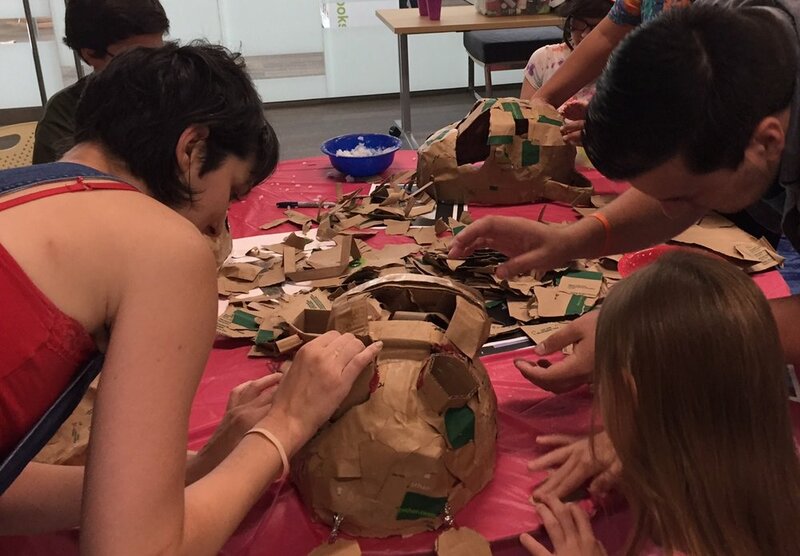 This paper mâché puppet workshop was hosted by Tonantzin Society and held in celebration of the 2018 DDLM holiday. 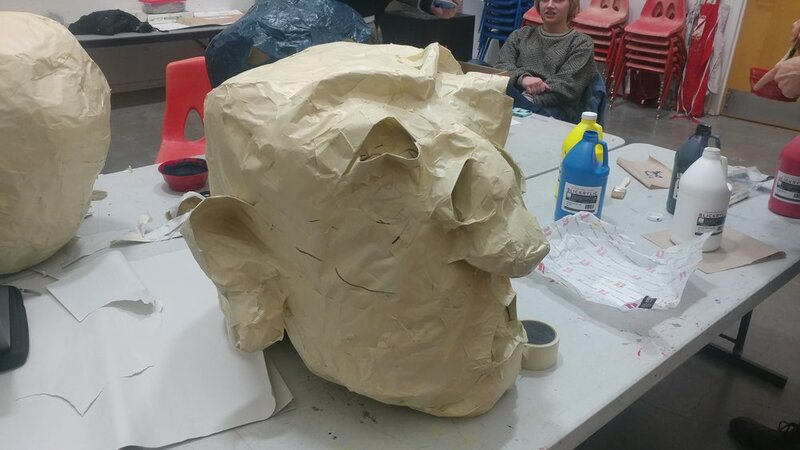 Participants learned how to make their own beautifully unique, handcrafted puppet calavera style puppet mask based on democratized papier-mâché techniques. The six hour work included a 15 to 20 minute demo followed by hands-on assistance and mentoring. 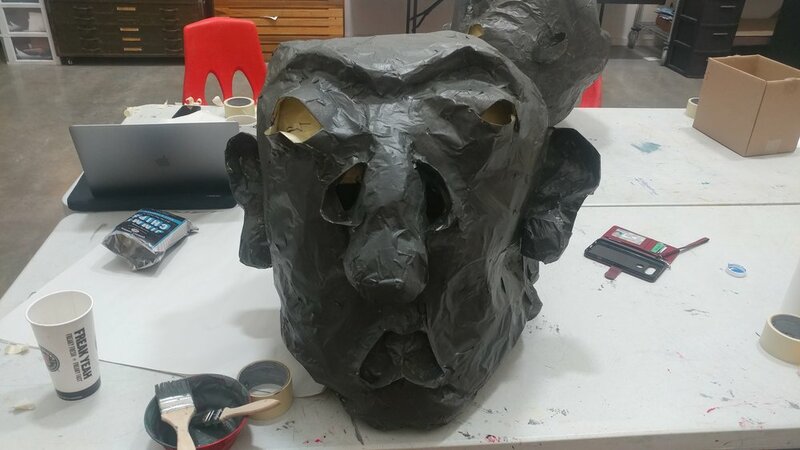 Participants learned how to sculpt mask structure using cardboard as a salvage material, then paper mached their masks using grocery store bag paper, and finished by embellishing their mask with paints, fabric materials and other details.